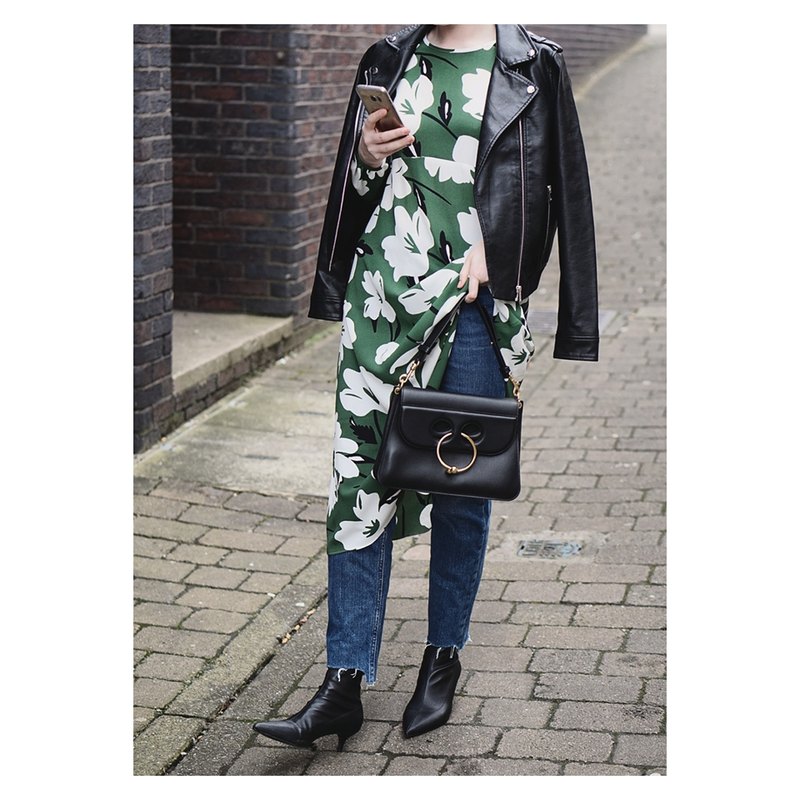 So, as I so eloquently mentioned; I'm back and I have actually shot some new outfits for you lovely lot to take a look at. The first of which involves a trend that hasn't appeared in my repertoire since the early nineties. That's right, the good old dress over jeans. The sartorial marmite, you will either lust or loath this familiar duo. 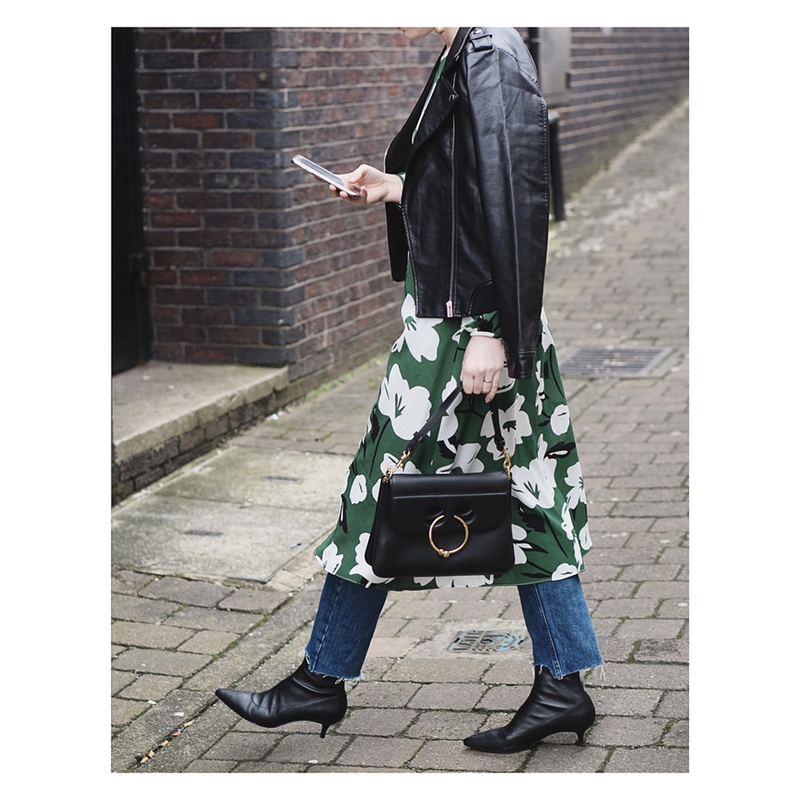 For me, it perfectly embraces the femininity I so often lack (I never wear dresses) with the more on trend, street style queen masculine vibes that we've been seeing from fashion week. 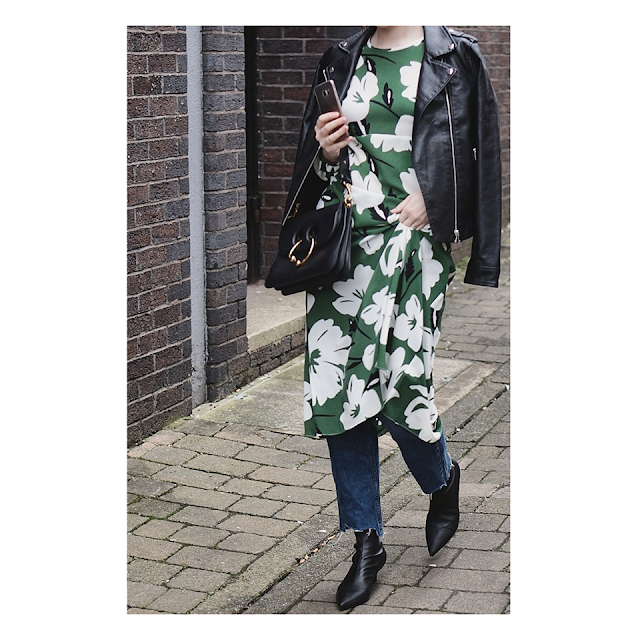 Although I had spotted the top fashionistas out and about in layered look, I hadn't actually had any firm plans of recreating it myself until a recent collaboration with one of my old faves, Dorothy Perkins, where they mentioned their new "must have" dress. I was immediately drawn to the colour and bold floral design and although admittedly not something I would usually go for, I felt the bizarre need to style it! It's no secret that green was big on the SS17 runways last year. This has led to an abundance of the sassy shade sprinkled throughout our high streets. This particular bold shade (I googled, apparently it's "shamrock" pretty apt considering it was Paddy's day on Fri, oh I do love to be topical!) fits well into my wardrobe. 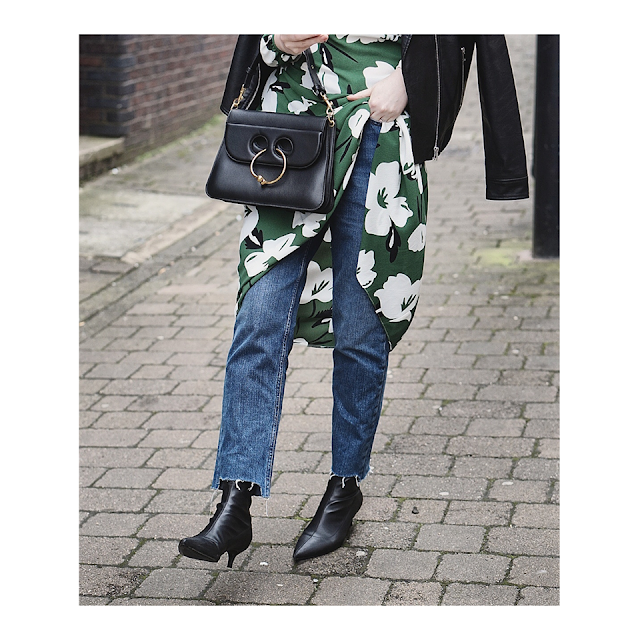 If you follow me on Instagram, you'll see I'm not exactly a colour connoisseur, but this green complimented denim (which is pretty much a daily occurrence in my OOTD's so is the ultimate goal), was a great length and fit (baggy, but slim) and I also love the abstract take on floral. So pretty much a great allrounder! I teamed it with my raw hem mom jeans, kitten heels and added a little bit off sass with my DP biker. 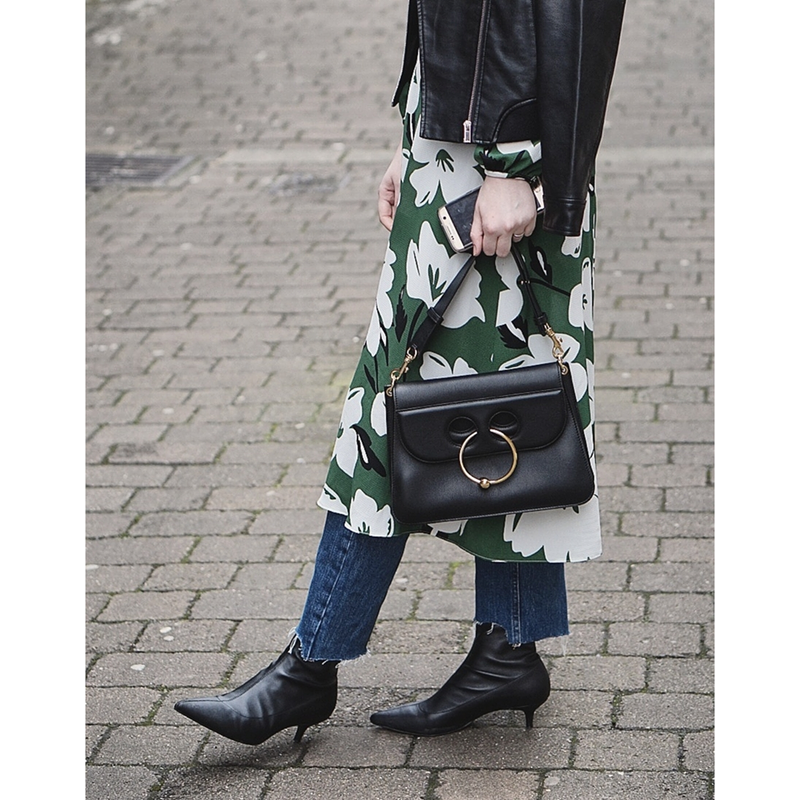 Obviously finishing the look with my new JW Anderson Pierce bag, which is the new love of my life (sorry Mus) which immediately takes it to another level, even if I do say so myself!